With stocks of Atlantic bluefin tuna down 75 per cent due to over-fishing, the European Commission said the trade ban’s rejection threatened the survival of the ocean predator. Environmental group Greenpeace also warned the vote ”sets the species on a pathway to extinction”. ”Let’s take science and throw it out the door,” Susan Lieberman, director of international policy with the Pew Environment Group in Washington, said sarcastically. I like tuna because it’s one of the few creatures the same size as me. Most creatures are much much bigger or much much smaller. 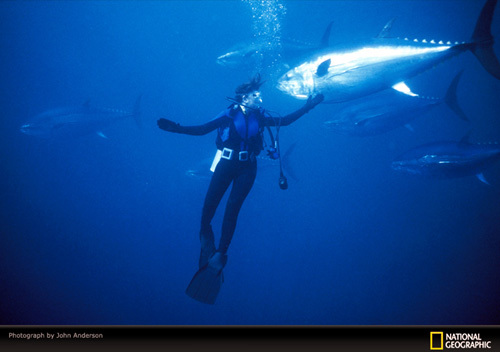 If I ever meet a tuna I can say “Why hello, my name is Kim and I am 40 to 200kg and 1 to 2.5 metres” and we’ll have so much in common.